I have never been to StAnza before and had been hoping to fit a visit in this year, so imagine my delight when I was actually invited to attend as a participant, an honour I had only previously dreamed of! 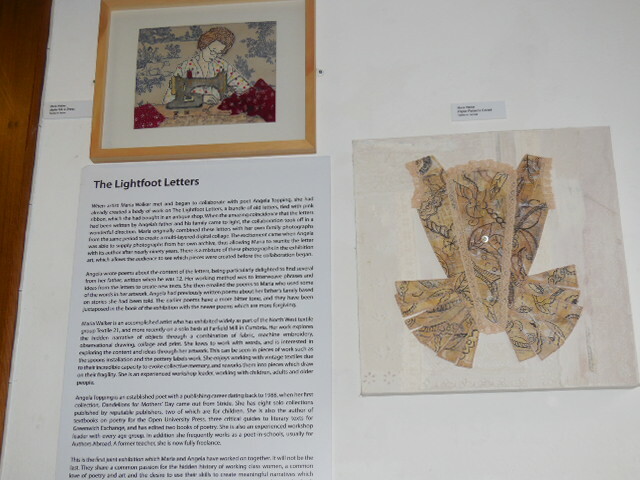 Eleanor Livingstone, one of the directors, had seen information and artwork from The Lightfoot Letters exhibition, which was a collaboration between myself and textile artist Maria Walker. The exhibition has been shown at The Brindley, Runcorn, Visual Arts Cheshire in Northwich (the kind and generous poet John Hegley came to the private view on that occasion) and Waterside at Sale. But StAnza is the first time it has been shown outside Cheshire. 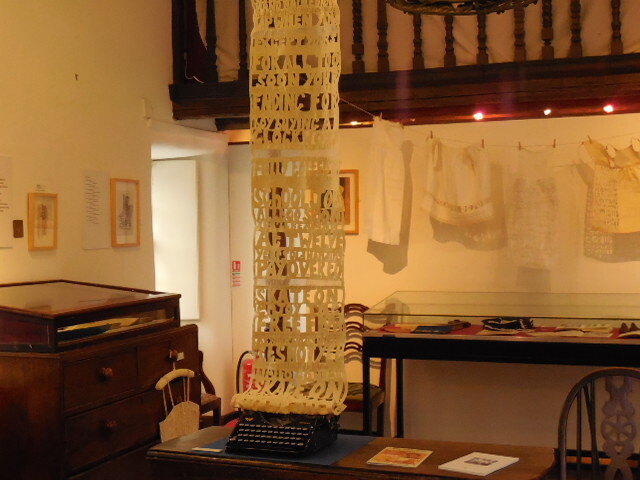 The exhibition will take place throughout the duration of the festival at the Preservation Trust Museum, with the artists talk taking place on the Saturday afternoon. 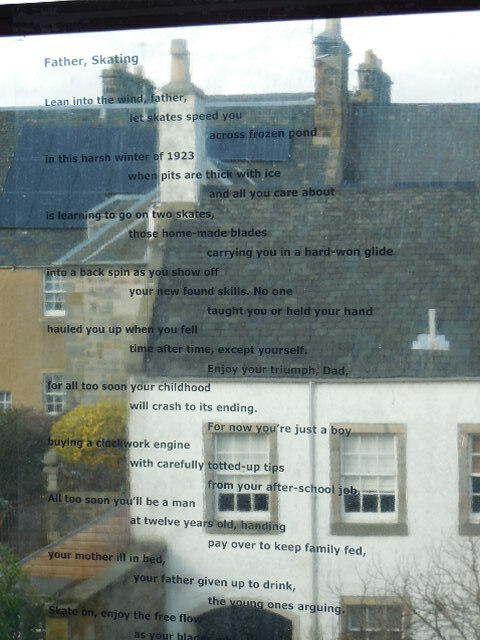 My poem ‘Father, Skating’ will be in the Byre, in vinyl letters (which I still think of as a form of magic), acting like a trailer for the exhibition. So this week I am busy preparing for the festival, sorting out my itinerary (because I hope to immerse myself in poetry and attend as many events as possible) and making notes of where I need to be and when.I hope to turn up to open mics to join in, bump into lots of friends and drag them back to the holiday house for coffee/wine/supper. I’m going to Paul Muldoon’s masterclass and John Greening’s events. Normally the exhibition has been mounted for us, but for the first time I am going to be involved in the curation, which was the best logistical way to do it this time. I know that StAnza is a wonderful festival. Everyone has told me how much fun I will have. I am really grateful to Eleanor’s keen eye and awareness of what is going on, even in distant Cheshire. The programme is very full with lots of variety and many wonderful poets. And yes, I’ve been warned to take lots of jumpers and woolies! Tagged as Eleanor Livingstone., Maria Walker, St Andrews, StAnza, The Lightfoot Letters. Well, the chapbook arrived yesterday and I am delighted with it. The publishers, Erbacce, have done a wonderful job and Maria Walker’s cover design is really beautiful. I have dedicated the book to my brothers and sister and I am looking forward to presenting them with a copy. I wonder what my dad’s family would have thought if they had known their letters would one day be published, revealing so much about working class life in a Northern industrial town in 1923. 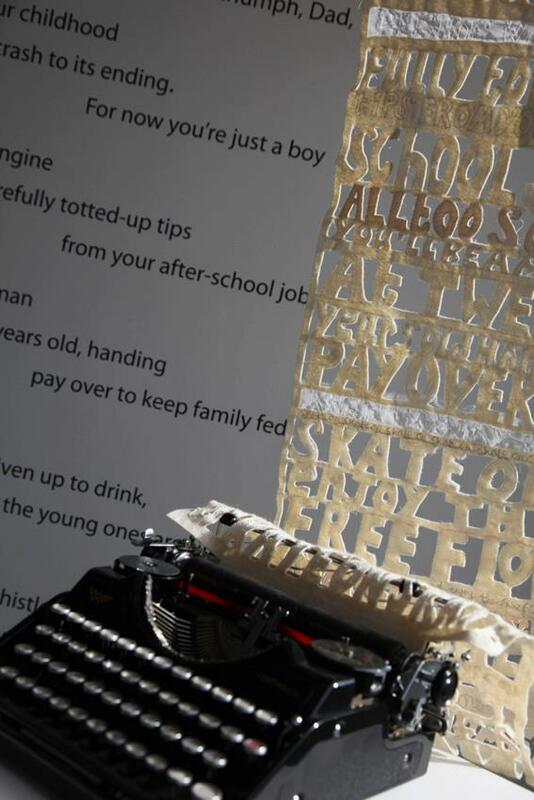 Maria wants me to write more poems, so my work is not yet done, but at least I have a publication to include in the exhibition at The Brindley, which will be happening in late summer this year. I have a feeling I will need to order another box of books by then as so many people have shown an interest in this project. A friend only remarked yesterday that Maria and I only discovered the connection of the letters in October – what a lot can happen in such a short time! 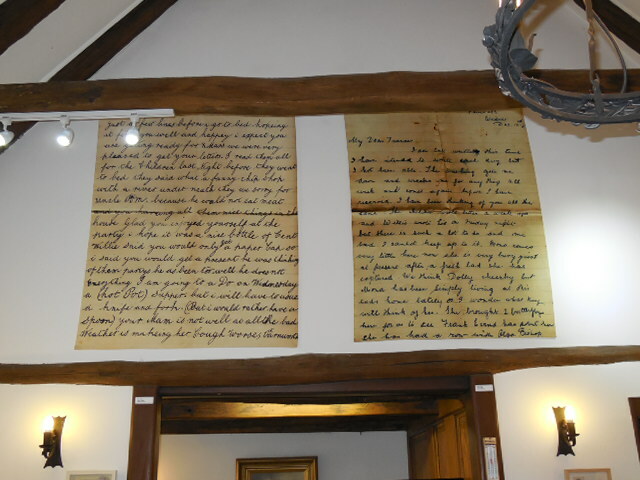 The discovery of the letters, and my doing some work in Widnes at my old library and Farnworth Church, has brought me back in time and back to Widnes in a very curious way. Having not thought much about the place for years, and recently severing my links with it when my in-laws moved away into a retirement flat near us, I suddenly feel closer to the place than I have for a long long time, even though I am a bit of a stranger in that it is all so different these days. The busy town square is pedestrianised, Simms Cross school has gone and the market has moved. The library now has a coffee shop – we would have loved that – and the road home past the foundry where my brother worked is now a dead end. Roots are so important and you can never dig them up. Maria and I had a very successful meeting at The Brindley last week and the project is all coming together nicely. We have seen the exhibition space and Maria is full of ideas for further artworks. 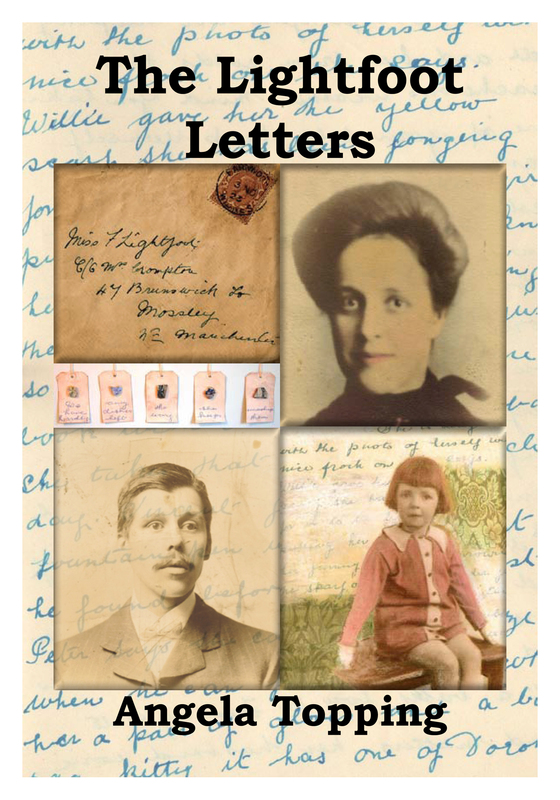 I have typed up nearly all of the letters and these have been put into a book with 5 brand new poems and 5 older poems which were in my book The Fiddle, written before the discovery of the letters gave me new insights into the family situation. I have interspersed the poems with the letters and ordered the book person by person in what appears to be the most logical order, so that the narrative unfolds as the reader moves through the pages. I have worked closely with Erbacce Press who are bringing out the book. We have endeavoured to keep the cost low so that hopefully people who do not normally buy poetry books will be prepared to invest their income for the sake of the letters themselves but will then enjoy the poetry. The Brindley will organise an opening, at which I will read both poetry and extracts from the letters. It will be a gala occasion and I hope to see many of my blog followers there. Many friends have told me they will be coming. 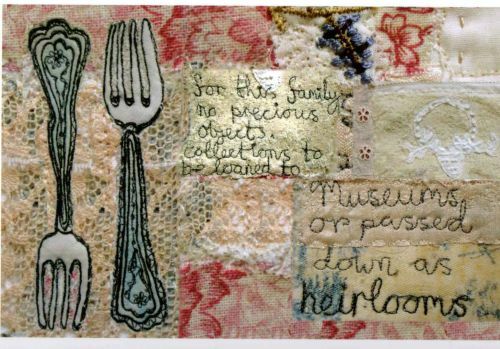 There will be a video installation of my reading as part of the exhibition, and I am hoping to commission some commemorative bookmarks from Sumptuosity, who have already made bookmarks of quotations from my work in embroidery on silk, with appliqued motifs using vintage fabrics. The Brindley shop will stock all my books for the duration of the exhibition, which starts in July. Maria will be providing postcards of the artwork for sale. And we are offering workshops as well. These will be advertised in The Brindley brochure nearer the time. I still can’t believe my luck that all this has happened. It’s brought me closer to my dad, even though we were very close when he was alive. My siblings too are very interested, if not fascinated, with it all and it has given us all a great deal to talk about and share in these past few months. Maria and I are firm friends as well, now. So many positive things have come from a strange coincidence, and it’s all down to the fact that my dad’s family were so tight knit that they write frequently to their sister in Manchester in the winter of 1923-1924, giving us a detailed picture of working class life at the time, which is of interest to those of us who came from a working class background and are now reclaiming our histories, as the histories of the real people behind social change. Tagged as Maria Walker, The Brindley, The Lightfoot Letters.